Thomas was the son of Edgar & Jane Burton of New Westwood, Jacksdale, Notts. The 1901 Census lists the family as follows: Edgar (aged 45), Jane (42), Charles (17), Harry (16), Amelia (13), Thomas (11), and Ethel (8 months). On the 1911 Census his brother Harry is listed as Henry and sister Ethel is listed as Esther. Thomas’s father Edgar originated from Bullbridge, Ambergate and was employed as a coal miner loader. Mother Jane was born at Whaley, Derbyshire. In 1911 all of Edgar & Jane’s children were still unmarried and living at home in New Westwood. The 1915 Electoral Roll lists his father as Edgar ‘Smith’ Burton of New Westwood. A John Arthur Burton is also listed at New Westwood in 1915 and it would be interesting to establish whether they were related. Prior to joining up, Thomas worked at the Pye Hill Pipe Works as a sanitary pipe maker. He enlisted in October 1915 and was sent to France on 5th March 1916. 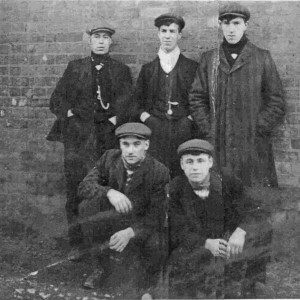 Thomas Burton & workmates back row, centre his brother Charles Burton front, right who survived but later succumbed to the effects of gas poisoning. Thomas was killed in action during the attack at Beaumont Hamel, France on Sunday 3rd September 1916, aged 28. 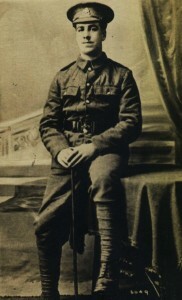 His elder brother Charles, also a Sherwood Forester, was discharged from service in December 1918. Charles is listed on the Jacksdale Memorial as having ‘served’ but was also a casualty of the war, dying on 29th March 1921, aged 37, from the effects of gas poisoning. 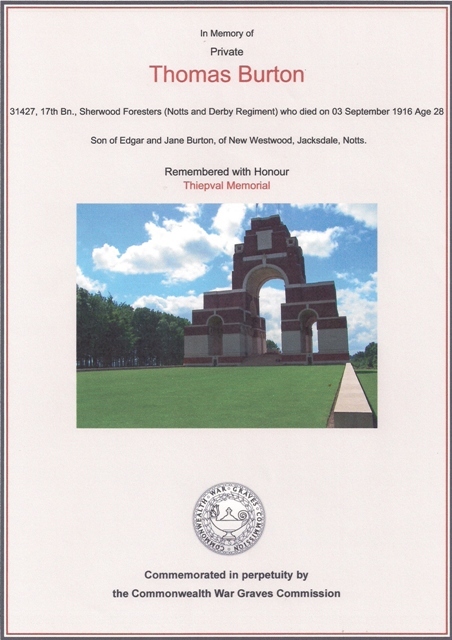 Tom Burton has no known grave and is commemorated on The Thiepval Memorial. Charles Burton is buried in St Mary’s Church Cemetery which also commemorates Tom with the inscription “Duty Nobly Done”. Thomas was awarded the British War and Victory Medals.